Gary Pinkel was ready for a step up after 10 years at Toledo. Even to a school that has had only two winning seasons in 17 years. Missouri hired Pinkel on Thursday, agreeing to a five-year contract worth about $900,000 per season. "I believe in myself," Pinkel said. "I've never had anybody ask me when I'm going to fail. I have a lot of confidence in myself and I don't say that arrogantly. "Are you looking for a prediction? We're going to be the best team we can be next year." 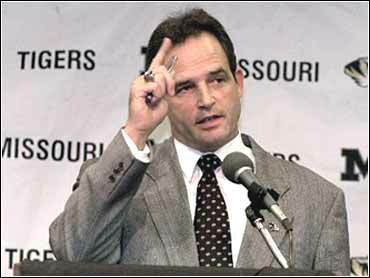 Pinkel, 48, replaces Larry Smith, who was fired Nov. 18 after going 33-46-1 over seven seasons. Missouri was 3-8 this year and has totaled seven victories the last two years since Smith took them to consecutive bowls in 1997 and '98. The bowl seasons are glowing exceptions since 1983 at Missouri, which has fired its last three coaches. Athletic director Mike Alden said the school's new commitment to winning made an impression on Pinkel, who also was a candidate at Arizona State, Arizona, Rutgers and Maryland. Alden said he has backing from the "highest levels," including the chancellor, president and curators. Pinkel was a finalist for the Washington job two years ago that went to Rick Neuheisel. Pinkel led Toledo to a 10-1 record this season. The Rockets feature a high-powered offense that topped 40 points five times and 50 points twice. The school is awaiting a possible bowl bid, although Pinkel won't be involved if it makes it to the postseason. He said any assistants that he hires at Missouri will return to Toledo in time to prepare for a bowl game. Pinkel met with his former players Wednesday night and most of his new team Thursday. "I had probably the toughest moment I've ever had when I had to tell my players I was coming to Missouri," Pinkel said. "I just want to publicly thank those players. "The only reason I'm standing here is because of those guys." Pinkel was 73-37-3 at Toledo with only one losing season, 4-7 in 1993, and has only been involved in one losing season in his last 22 years in football. It didn't take Alden long, only 11 days, to decide Pinkel was his man. "He's focused, he's organized, he's a player's type of coach, he's firm, he's disciplined, and he wins," Alden said. Pinkel is the second mi-major hire by the school in recent years. Bob Stull, who came from Texas-El Paso in 1989, was a major disappointment with a 15-38-2 record in five years before being fired in 1993. Pinkel has major college experience, however, with 12 seasons as an assistant coach at Washington under Don James. That stint included seven years as offensive coordinator. "While he did a great job at Toledo and there's no question the guy can win, I think those experiences he gleaned at Washington are invaluable," Alden said. Only six Missouri players, including standout defensive end Justin Smith and quarterbacks Kirk Farmer and Darius Outlaw, attended the news conference. But Pinkel didn't see it as a sign that the team still hasn't gotten over the firing of Smith. "I hope they supported the old coach," Pinkel said. "The first thing I told them is first of all, there will never be anything negative said by the players or myself about coach Smith. "The players now are my players, I'm adopting them and that's the end of that." Justin Smith, a junior, said earlier this season that he would make himself available for the NFL draft if Larry Smith were fired. He's since softened on that stance and now says he'll probably leave only if he's projected to be a high first-round pick. "I'd like to come back," Smith said. "I feel I owe it to Missouri and my teammates, but when the situation is there, then it becomes a little bit of a business decision. "Just like Coach Pinkel leaving his Toledo job to come here."